It has only been two weeks since my last “What Am I Thinking” (W.A.I.T.) contest, but oh well, I came across a fantastic picture that just needs a great quotation. You come up with what my friend, Mike Geisen, is thinking and if I think yours is funny enough I’ll put it into the “In the Running” section below the picture. After a day or two, I’ll crown the WAIT winner. Background: Mike was one of my best friends growing up. After college and a career in forestry, Mike became a Science teacher in Oregon. Well, long-story-short, he was named National Teacher of The Year last year. 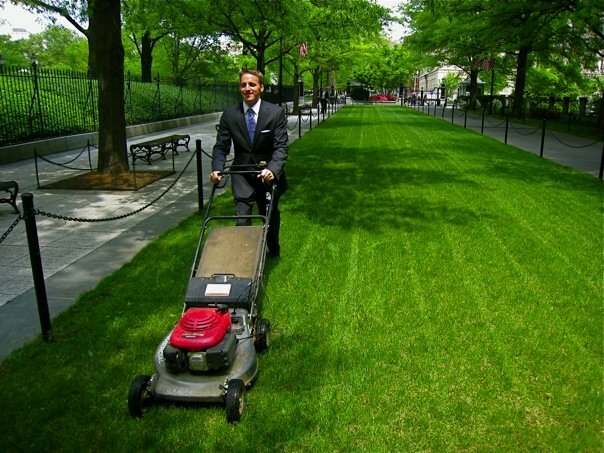 So, here he is, showing his great sense of humor by mowing the lawn at the White House! Yep, that is literally White House property! So, give me your WAIT Caption in the comment section below. No worries if your quote doesn’t show up right away, I often have to approve them first. Have fun. Winner gets a dinner invite from the Aabys (or if you’re out of town, next time I/we are in your neighborhood we have dinner together). the grass it is green. *Props to Mike for commenting as well! Loved ’em! Great job to all who participated. I have to go with Ricky! Because we have education in our family (Dad is a retired teacher and my brother is a teacher), I have heard about teacher pay all my life! Good job Ricky. Congrats to Ricky on the win, we’ll have you over for dinner soon. And congrats to Mike on the year of being National Teacher of the Year 2008-2009! You’re welcome for dinner anytime you come up Mike! We aren’t going to ruin Mike’s day and break the news to him that they actually invented RIDING lawn mowers. He looks like he’s having way too much fun! Well at least they aren’t making me disect anything. This “Joe Biden Job Shadow Day” is awesome! According to White House Press Secretary, President Obama has ordered White House secret service agents to blend in with the everyday White House functions in order to provide added security. The least they could have done was give me a self-propelled mower. These budget cuts are getting ridiculous. Great comments, everyone. Just a little background, though… I usually mow with an acoustic lawn mower (I’m a reel man). And this was during the Bush presidency. You don’t have to mow straight to be straight! If you like the presidential mower, wait till you see the presidential plumber! It’s nice that carhartt has made a pin stripe suit. Joe Biden’s son has to earn his allowance some how. Man, I should never have told Cheney that he is a bad shot! You should see this guy trim hedges. I wonder if that lawn mower was made in America? Wow, I have a better lawn mower than the President! I see Bush is firm on his immigration stance! Honey, you told me to ask the neighbor’s son if he wanted to make $10. This is what Teddy Roosevelt had in mind! It’s the NEW New Deal! Look at him strut. This guy will win “America’s Next Top Mower” for sure! The next time I come to the White House I’m using the RIDING mower. Is this thing broken?? Don’t lawn mowers blow bubbles? *Geisen. sorry–not good at typing (or thinking?) with one hand while feeding a baby at 3am. Night!